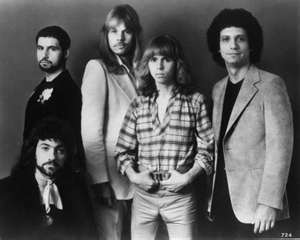 REO Speedwagon’s “Hi Infidelity” might have been the first album I encountered when I returned to the States in 1981 but “Paradise Theatre” from Styx was the first album I encountered when I got home on leave. After being slightly disappointed with their more progressive “Cornerstone” album, I was more optimistic that, with this album, they would return more to the harder sounds of “The Grand Illusion” and “Pieces of Eight.” My optimism became well placed when I heard the first single offered up to radio from the album, “The Best of Times.” The start took me back to the days of “Come Sail Away” and like those days, the song has that traditional Styx guitar solo compliments of Tommy Shaw. Then came the second single, “Too Much Time On My Hands.” That song reminded of the very popular “Renegade” from the “Pieces of Eight.” Those songs were more than enough for me to check out the rest of the album. 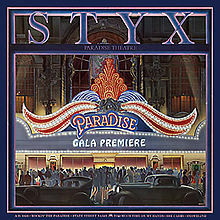 What I find interesting on the “Paradise Theatre” album is that Styx try to go back to their roots while at the same time, also try to branch out into different directions. First there are the more traditional Styx tracks like the two already mentioned plus the very memorable “Snowblind,” “Rockin’ In Paradise” and “Halfpenny, Two-Penny,” all cool rockers. Then there are the other songs which they incorporate saxophone solos from Steve Eisen. It’s easy to think “What the hell are they doing here?” especially from those in the “No horns in hard rock or metal” brigade, but in each and every song, those sax solos work. Most notable is the track, “Nothing Ever Goes as Planned.” That song works well on so many levels. All of that aside, I think the main element that convinces me that they are going back to their roots with this album is that Tommy Shaw and James Young work their magic on each and every song save for the short opener and closer. They definitely demonstrate they still know how to bend a six string and as it did then, it makes it for me now. After six months away from home while serving your country, two weeks of leave is something that is definitely needed to regain one’s sanity. I managed to do that and this album from the dependable Styx was certainly a great help. Some say that this album was a sort of last hurrah for them. I don’t know about that nor do I care, I just love the album. You are currently browsing the 80smetalman's Blog blog archives for January, 2014.